Ahhh, Mac & cheese. A traditional comfort food. What’s better than some ooey gooey cheesy macaroni on a cold winter day or after a stressful day at work/school? But, we all know how Velveeta and Kraft’s nutritional stats hold up. And after preparing Kraft’s boxed version with butter and milk, I sure got the blues (of regret for eating it!). So, Mom Made Foods makes a healthier alternative to macaroni & cheese. “Mom Made” makes it seem like it’s geared toward children, but trust me, all ages can enjoy this dish. 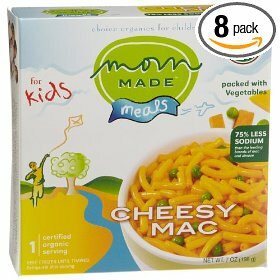 Mom Made Cheesy Mac Meal has some extra health benefits in their yogurt. They sneak in butternut squash and sweet potatoes in their cheese sauce- but you would never tell. After heating up this individual tray (yay portion control! ), you don’t see any chunks of squash or potatoes, just a bunch of elbow macaroni and cute little peas as well. After heating it up, the macaroni cooked nicely. It wasn’t too chewy or overdone either. Just the way I like my macaroni- has a bite but doesn’t fall to pieces in my mouth. The peas were nice and crisp too, not mushy blobs. I personally love peas, and i hate when frozen dinners ruin them by making them all soggy and nasty. Not the case here! Overall, i liked it. 4 stars for me for excellent nutrition stats and sneaky veggies. There are a lot of noodles in this entree, especially considering it’s geared toward kids. However, I would say it’s a tad too small for an adult or those of us with raging appetites (especially after going to the gym), so i paired it some strawberry organic milk and some extra veggies and had it for lunch. My only complaint is that it’s not made with whole wheat macaroni, but it still packs in some fiber 🙂 I would love love love to try the other things Mom Made Foods has to offer, like fiesta rice and bean burritos! 1 entree is 200 calories, 3 grams of fat, 36 carbohydrates, 4 grams of fiber, and 10 grams of protein. Organic macaroni (organic durum semolina), Organic skim milk (organic pasteurized skim milk, vitamin d), Organic green peas, Organic sweet potato, Organic butternut squash, Organic cheese powder (Organic cheddar cheese [organic pasteurized milk, salt, cheese cultures, enzymes], Organic whey, Salt, Lactic acid, Citric acid, Annatto [for color], Natural mixed tocopherols); Organic butter (organic sweet cream, salt).